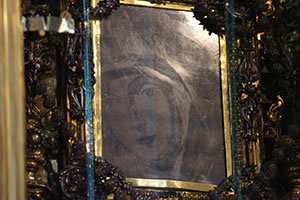 On 17 January 1797, between 3 and 4 p.m., 18-year-old Rosina Bucher discovered a portrait of the Virgin Mary on a window pane on the ground floor of her parents’ home in Absam/Tirol. 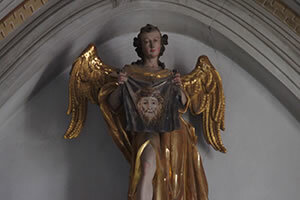 After the apparition, the image was subjected to thorough examination by secular and ecclesiastical authorities, scientists and tradesmen. No traces of external influence and no differences in the surface texture were found on the smooth glass surface. The motif could be washed off, but reappeared within a short time, beginning with a clouding of the glass. Chemical substances likewise failed to remove the image permanently. When various grinding and polishing methods were applied, only areas of the image polished with diatomaceous earth did not reappear. Although the authorities concluded as a result of the investigation that no miracle had occurred, the people of the village brought the image to the parish church of St. Michael, which became the most important church of pilgrimage of the Virgin Mary in Tirol, and was declared a basilica by Pope John Paul II in 2000. The image appeared on the fourth section of the upper half of an inner window casement – a pane measuring approximately 0.18 m x 0.13 m. It is not centered on the glass pane, but displaced towards the left edge/left lower corner. The image resembles not so much a photo but a black-and-white, expressionistic woodcut, which focuses on the essential information of the model thanks to the lack of color and fine contours. While the cloak of Our Lady of Guadalupe covers the parted hair on the Virgin’s head, a double veil envelopes the head of Our Lady of Absam. The cloak is surrounded by sunbeams, the veil by a halo. In both images of the Virgin Mary, the head is inclined to the right at similar angles. While the gaze of the Blessed Virgin of Guadalupe is directed to the lower right, the Virgin Mary of Absam appears to look at the viewer while lost in thought. Tears are visible in the right eye. 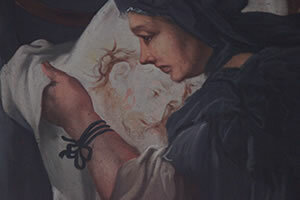 The four images – not created by human hands – of Mary and Jesus – in each case a portrait and a full-body image – resemble each other, and all of them have a long, narrow nose.